A former Centennial resident has developed a new wearable technology product that could change the way we interact with the world. 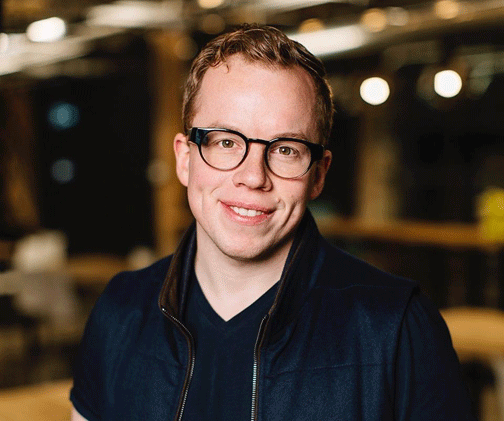 Stephen Lake, who attended Sir Oliver Mowat Collegiate, is the CEO of a Kitchener-based corporation called North, which makes custom-made smart glasses. The high-tech glasses, named Focals, allow people to check the time and date, view calendar reminders, and check the weather, all in their field of vision. They also provide intuitive navigation and work with Alexa, Amazon’s popular voice assistant. Apart from their technical function, the glasses could eliminate the hazards that ensue when people look down at their devices. Stephen, 28, along with partners Matthew Bailey and Aaron Grant, spent four years developing the intricate technology required to make the product. While news of Stephen’s venture has been in the headlines of late, his talents have been evident for a while. In 2007, he was named one of Canada’s Top 20 Under 20, an award recognizing young people who have achieved high levels of innovation, leadership and achievement. In 2011, he was selected one of The Next 36 entrepreneurial leaders in Canada, which gave him the opportunity to study entrepreneurship under the direction of established Canadian business experts. In developing North, Stephen and his team were able to attract $140 million in investment funding from companies like Intel Capital and Amazon. They have filed 300 patents and plan to invest $500 million in research and development by 2030. Last month, the Canadian government pledged $24 million to help North hire 185 employees (in addition to 450 current staff), increase research and development, and expand its manufacturing capabilities. Stephen’s technological savvy and visionary thinking have afforded him the opportunity to host people like astronaut Chris Hadfield and former prime minister Stephen Harper at his company headquarters. Stephen’s parents, Mike and Stephanie Lake, who still live in the neighbourhood, recognize the role Mowat played in shaping their son. Stephanie remembers her son ordering a welding kit and working with it at the school. She said Mowat also encouraged him to show leadership in the community by helping others. After Mowat, Stephen studied mechatronics on a Loran scholarship at the University of Waterloo. To balance out his heavy academic schedule, he coached the university dragon boat team, an interest that stemmed from Mowat’s strong dragon boat culture. After university, Stephen made his first venture into wearable technology by launching the Myo armband, a product that allows users to control technology wirelessly with hand or wrist movements. The company is now putting all its efforts into their new optical product. The stakes are fairly high with this venture since smart glasses have been tried before – and then abandoned – by tech giants like Google. Fortunately, Stephen is not afraid to tackle new challenges that may, one day, change human development. He is hopeful the product’s stylish design catches on with customers. Focals, which cost $999 U.S. a pair, are available in retail stores in Toronto and Brooklyn, N.Y. Prescription lenses will be available soon.